Bryan Hart practices all areas of patent law, specializing in preparing and prosecuting patent applications in the mechanical and electrical arts. He excels at mastering complex technical information while maintaining the big picture and communicating key concepts in a comprehensible, concise, and persuasive manner. His applications have covered autonomous vehicles, object tracking for collision avoidance, seatbelt assemblies, airbag assemblies and deployment, vehicle crash testing, additive manufacturing, and automobile frames, among other areas. 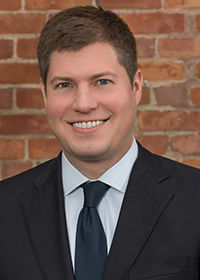 Prior to joining Bejin Bieneman, Bryan practiced patent litigation at a national law firm in Chicago. He participated in cases in federal district court, investigations before the International Trade Commission, and inter partes review proceedings before the Patent Trial and Appeal Board. He has experience with a wide variety of technologies, including LTE (long-term evolution) standards, in-dash GPS units, textiles, enterprise storage systems, mobile-phone operating systems, lottery-ticket printing, hydraulic fracturing (fracking) equipment, lithium-ion battery packs, 2D-to-3D conversion software, cloud computing, content distribution networks, piston solid lubricants, and prosthetic knee replacements. His litigation experience helps him keep a patent’s ultimate potential outcome—enforcement—in mind throughout the prosecution process. Bryan is a graduate of University of Chicago Law School (J.D., 2009), where he was an Articles Editor for The University of Chicago Review, and a graduate of University of Michigan College of Engineering (B.S.E., Mechanical Engineering, highest honors, 2006). He is also a member of the American Bar Association (ABA) Intellectual Property Law (IPL) Section.